You are here: Home » Countries & Places » Europe » Kavos – traditional Greek holiday or Brit nightmare? Kavos – traditional Greek holiday or Brit nightmare? “Do you fancy a break before the season starts properly?” a pal asked me a few weeks ago. “Somewhere nice, warm and relaxing,” he added. Having worked particularly hard throughout the winter, and with the promising early spring sunshine back into hiding, I thought it seemed like a good idea. “Where do you fancy?” I inquired. Normally, this would have been my idea of paradise. I have for many years been a devotee of Greek Island holidays, finding the Greeks helpful and friendly, the food excellent and the wine – well, perfectly drinkable and sometimes quite good. Accommodation has always scored on the low side for me, but I suppose if you weigh up the good against the rudimentary, two weeks basking in the sunshine on a beautiful island is worth the price of meagre beds, a hand-held shower and inadequate plumbing (not so bad if your cleaner empties the ‘little bin’ once a day). But I had heard some mixed reports about Greece last year: high prices, falling standards and poor weather. It had been rumoured that Brits were deserting the country in their droves, favouring more exotic locations which, years ago, would have been well out of budget. Thinking it might be fun to put it to the test, I gave it little more consideration and acquiesced. A trip to our local travel agency later that week procured a two-week stay in Kavos on the Ionian island of Corfu, situated just west of the mainland and north of the beautiful islands of Paxos and Antipaxos. “It’s a bit on the lively side,” the girl in the shop had warned, “but there’s a long, sandy beach.” It didn’t sound quite like the Greek holidays I preferred, but having stayed at various Greek islands over the past twenty years I knew that – even in a lively resort – you could take or leave the club scene. And at a snip of £203 each, including supplements, courtesy of Olympic Holidays, who could complain? We arrived in resort at about eight in the morning after a nightmare of a journey. Well, in truth, it probably wasn’t that bad (what do you expect from a night flight?) but the catalogue of complaints from our fellow travelling companions made it seem much worse. “This has ruined my holiday already,” one chap told his exhausted wife and sleeping daughter after spending “the worst hour and a half” of his life at the baggage reclaim. Makes you wonder what kind of charmed lives people like this must lead ordinarily. The worst part of the whole voyage was, without doubt, the last three-and-half minutes, during which we had to scale a mountain with our luggage. Later reconnaissances revealed that it was, in fact, a fairly mild incline, but taken after twenty-four hours without sleep and carrying what felt like two steamer trunks it seemed much more sinister. The rest of the afternoon was spent lazing on the beach, surrounded by young, beautiful things that made me feel every inch my age. The young and beautiful stage seemed to pass me by, but there must have been something equivalent in my day. Perhaps I was too busy trying to be young and beautiful to notice it. It’s true, Kavos is a clubbers’ paradise – for a moment I thought I’d turned up on Ibiza and was expecting to run into Boy George or Fatboy Slim, and it is designed around that clientele accordingly. I’ve never felt so old; previously I hadn’t thought I was doing too badly for my thirty-nine years, my pal certainly wasn’t for a retired sixty-two year old. Yet here was a new challenge: carve out a holiday that would suit our more sedentary tastes among all this youthful extravagance without becoming ‘old fuddy duddies’. We were both up for it. It was evening before the whole island seemed to turn entirely into a vast nightclub. 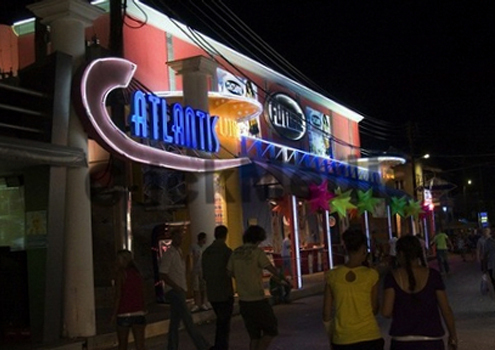 ‘The Strip’, Kavos’s main street of activity, metamorphosed before our very eyes into a party of coloured neons and sounds, wild, young touts trying to tempt us to get ‘ruined’ and ‘wasted’ with free drinks vouchers. If you plumb for this line of entertainment in the day, incidentally, you’ll be fine as long as you like football or vintage comedy – finding a bar without either the latest match plastered over a wide screen TV, or re-runs of Only Fools and Horses or Friends is nigh-on impossible. We resisted, preferring the calm afforded by a glass or two of Demestica (watch you don’t pick bleach off the shelf by mistake) on our balcony, tenderly lit by the flickering glow of our anti-mozzy candle. As devoted tourists to Greece will know, you can use all the plug-ins, sprays and roll-ons you like, but the mosquito battle is one you will never win. Still, best not to give yourself over to them too early in the holiday – they like you to put up a bit of a fight, and this time I only went home with thirty-six nasty blemishes adorning my otherwise bronzed body. It looked as if I had fallen victim to some strange foreign pestilence; perhaps I had. It’s true then – Kavos has turned into a playground for the young British tourist, most of whom are well-behaved, but with the occasional fringe louts – two of which decided to smash the apartment next to us up at four o’clock one morning. It seemed their only adjective began with ‘f’ and it shamed us to think they shared our Nationality. Not difficult to see why we Brits come out bottom of the poll when it comes to good behaviour abroad. But you can still eke out a pleasant holiday if you are prepared to make the best of it. We discovered that we weren’t actually the oldest people in the resort, and all seemed to be enjoying themselves. Tom and Barbara, a couple we met who were both retired, enjoyed complaining about everything from the Greek buses turning up twenty minutes late (have they never heard of GMT – Greek Maybe Time?) to the ‘disgusting lack of facilities in our apartment’ – this is Greece; it’s all part of the fun – get over it and enjoy your holiday. Which they certainly seemed to do, judging by the fun they appeared to be having in some of the livelier pubs later in the evening. “Well, if you can’t beat ’em, join ’em,” Tom had acceded. And it’s still cheap enough to eat out for every meal, even for a family. It’s true that the euro has been used to a degree to inflate prices (just as decimalisation was in the UK in the early seventies) but not criminally. Greek tavernas still offer incredibly good value for money, some off ‘the loop’ – a one-way street just off ‘the strip’ – providing a three course meal for eight-and-a-half euros (although you’ll probably get chips with it); some will even throw in a half litre jug of local wine. Our little hill did turn out to be a blessing in disguise though, stationing us up and away from the noise of the late, late clubs and bars. Tom and Barbara seemed to think it made it worse for them, (“all this climbing at our age!”) but had obviously not heard the plight of those poor families with young children who could reach across from their balconies and physically touch the wall of an adjoining night club. We saw many of them looking drawn and exhausted during the day after yet another long, sleepless night. And one night in particular stands out as traditionally Greek. On a beautiful, moonlit night, we ate just by the shore at the ‘Likourgos Taverna’ serenaded by our own seventy-five year old guitar playing minstrel (father-in-law of the proprietor, we were later informed). The cuisine was traditional and superb, and the service attentive and friendly – but then it should have been; sadly we were the only diners. More of this can still be found, as a day trip to the less populated island of Paxos (costing a mere 22 euros) revealed, but not very easily in Kavos. “We were much busier ten years ago,” the owner told us in lamentation, “even the Germans can’t stand it anymore – but maybe the good times will come back.” We hope so, for his sake and that of Greek islands generally, but we won’t hold our breath – the reluctant traders know that without the current wave of Brit-clubbers, the island of Corfu would be in serious trouble.